We will be hosting Professor Henry Akins for his very first seminar ever in the southeast! 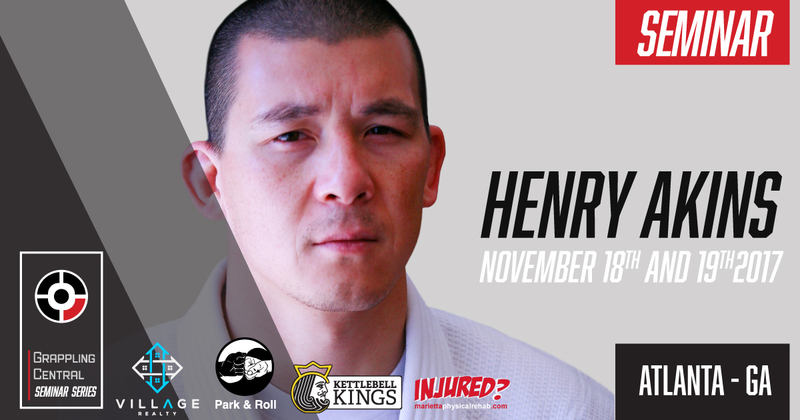 Henry is a world renown instructor, 2x guest on the podcast and his seminars are known to be some of the best in the world! Practitioners of all levels including elite competitors and fighters regularly seek his knowledge and advice. He is the third American to earn a Black Belt under Grandmaster Rickson Gracie, and is known for his “Invisible Jiu-Jitsu” concepts that are game changing for those who learn it. Be sure to check out his latest episode on the podcast to learn more about his philosophy and approach to Jiu-Jitsu. The event will be held at Life University in Atlanta, GA on Saturday November 18th from 12pm – 3pm and on Sunday November 19th from 11am – 2pm. $100 for one day or $150 for both days. This will be a Gi seminar on both days, so bring your Gi! Space will be limited! If you live in Georgia or if you can make the trip to Atlanta, reserve your spot now! This is a rare opportunity to learn directly from one of the greatest Jiu-Jitsu instructors in the world. His seminars are highly coveted so we expect it to fill up fast! Don’t wait! Must be 15 years of age and up to attend. All affiliations, schools and skill levels are welcome! Select which option you’d like below and click “Add to Cart” to reserve your spot now! We look forward to seeing you there!